BIRMINGHAM, Ala. (AP) — Sen. Elizabeth Warren wrapped up a three-state Southern swing on Tuesday with appearances in Alabama, where the Democratic presidential candidate ramped up her call to eliminate the Electoral College. Warren told an enthusiastic audience of 500 in the state’s largest city, Birmingham, that a popular vote would help refocus candidates’ energy on the concerns of the entire nation, not simply “states that are in play” as they seek the White House. Warren, when pressed Tuesday on how she would accomplish a shift to a national popular vote, said it could happen through a “constitutional amendment, someday.” But instead she urged the crowd — to laughter from some voters who doubted the viability of the idea — to push for the passage of a state law that would award Electoral College votes for president to the winner of the most votes nationwide. Colorado recently became the 12th state, all of them Democratic-leaning, to join the National Popular Vote Interstate Compact, an alliance organized to advance toward that goal. Alabama is among the reddest states in the nation. Warren also tackled health care during her question-and-answer session with voters, describing a “Medicare for All” single-payer system as “where we’re aiming” but also drawing attention to the urgency of protecting former President Barack Obama’s health care law in the nearer term. She is backing a single-payer health care bill written by her Democratic presidential rival Sen. Bernie Sanders of Vermont, while two other White House hopefuls — Sen. Amy Klobuchar of Minnesota and former Texas Rep. Beto O’Rourke — have stopped short of endorsing that full transition to a government-run system. Warren began the day with a walking tour of Selma, a center of the civil rights movement where the Rev. Martin Luther King Jr. led a 1965 march to draw attention to the disenfranchisement of African-Americans. Accompanied by Alabama Rep. Terri Sewell, who grew up in and represents Selma, Warren visited local businesses and toured a historic church that served as a meeting point for civil rights marchers. In addition to her affordable housing plan, Warren reiterated her commitment to prioritizing voting rights if she wins the White House. She told the Rev. Leodis Strong at Brown Chapel AME Church that she would put “federal muscle behind” ensuring ballot access for all Americans, a critical issue to African-American voters in the South. Warren also connected her case against the Electoral College to the importance of making every voter’s concerns count. The Electoral College dissuades candidates from coming to her Democratic-leaning home state of Massachusetts as well as to GOP-leaning Alabama in the general election, Warren said, “because they figure we’re not in the game.” She spoke with reporters alongside Sewell after walking to the Edmund Pettus Bridge, a landmark site in the civil rights movement where police attacked marchers in 1965. 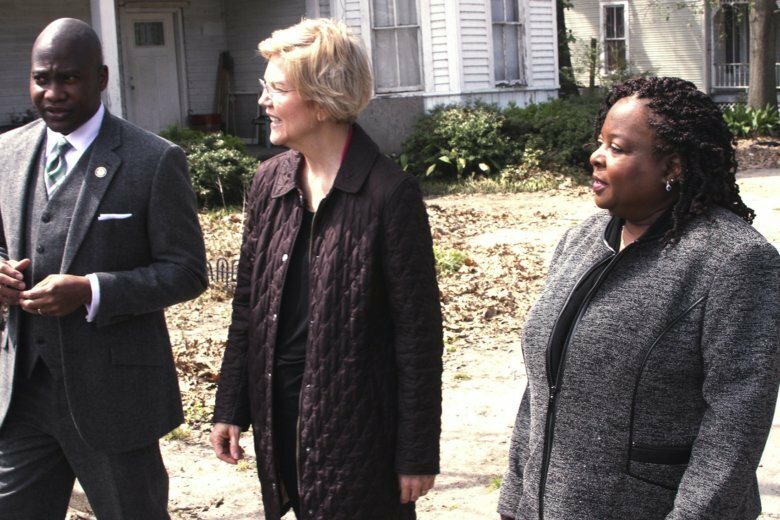 Warren previously visited Selma in 2015 on the 50th anniversary of those demonstrations. Alabama holds its primary on Mar. 3, 2020, also known as “Super Tuesday” for the number of states casting their ballots that day. Warren made the state her last stop in a Southern visit that began in Tennessee on Sunday. Warren moved to Mississippi on Monday, holding a nationally televised CNN town hall there. During that event, Warren also endorsed a congressional plan to study potential reparations to the African-American community.